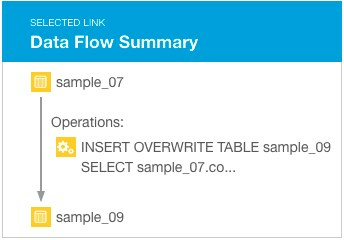 Cloudera Navigator provides an automatic collection and easy visualization of upstream and downstream data lineage to verify reliability. For each data source, it shows, down to the column level within that data source, what the precise upstream data sources were, the transforms performed to produce it, and the impact that data has on downstream artifacts. A lineage diagram is a directed graph that depicts an extracted entity and its relations with other entities. A lineage diagram is limited to 400 entities. Once that limit is reached, certain entities display as a "hidden" icon. See Viewing the Lineage of Hidden Entities. Important: Tables created by Impala queries and Sqoop jobs are represented as Hive entities. The entity has not yet been extracted. In this case, is eventually replaced with the correct entity icon after the entity is extracted and linked in Navigator. For information on how long it takes for newly created entities to be extracted, see Metadata Extraction. A Hive entity has been deleted from the system before it could be extracted. 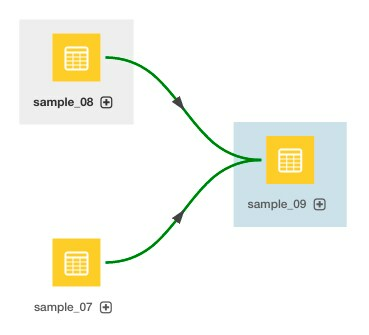 Data flow Describes a relation between data and a processing activity; for example, between a file and a MapReduce job or vice versa. Parent-child Describes a parent-child relation. For example, between a directory and a file. Logical-physical Describes the relation between a logical entity and its physical entity. For example, between a Hive query and a MapReduce job. Instance of Describes the relation between a template and its instance. For example, an operation execution is an instance of operation. Instance of relations are never visualized in the lineage, however you can navigate between template and instance lineage diagrams. See Displaying an Instance Lineage Diagram and Displaying the Template Lineage Diagram for an Instance Lineage Diagram. Control flow Describes a relation where the source entity controls the data flow of the target entity. For example, between the columns used in an insert clause and the where clause of a Hive query. Solid ( ) represents a "data flow" relationship, indicating that the columns appear (possibly transformed) in the output (when directional with arrow) and "logical- physical" (when no arrow). For example, a solid line appears between the columns used in a select clause. Dashed ( ) represents a "control flow" relationship, indicating that the columns determine which rows flow to the output. For example, a dashed line appears between the columns used in an insert or select clause and the where clause of a Hive query. Control flow lines are hidden by default. 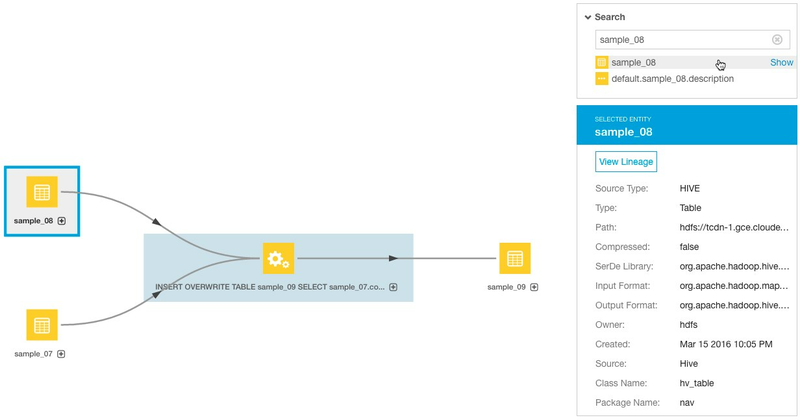 See Filtering Lineage Diagrams. Blue ( ) represents a selected link. To improve the layout of a lineage diagram, you can drag entities (in the diagram above midsummer.txt and pout) located outside a parent box. control to zoom the lineage diagram in and out. You can move an entire lineage diagram in the lineage pane by pressing the mouse button and dragging it. The Only Upstream/Downstream filter allows you to filter out entities and links that are input (upstream) to and output (downstream) from another entity. Use the Latest Partition and Operation filter to reduce rendering time when you have similar partitions created and operations performed periodically. For example, if Hive partitions are created daily, the filter allows you to display only the latest partition. If you display the lineage of the sample_09 table with no filtering options selected (other than hiding deleted items), the lineage appears as follows. Control Flow Relations - The operation is collapsed and control flow links are hidden. 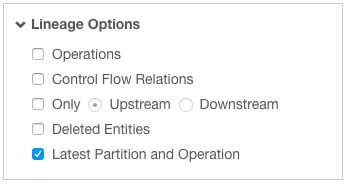 Show Upstream and Show Downstream - The operation is collapsed and only upstream entities and links are shown. The output table is hidden. Here, the operation is collapsed and only downstream entities and links are shown. The input tables are hidden. Operations - In the diagram, the operation is hidden. The green links indicate that one or more operations are collapsed into the links. Deleted Entities - Here, the operation is hidden but deleted entities are displayed. In the Search box at the right of the diagram, type an entity name. A list of matching entities displays below the box. Click an entity in the list. A blue box is drawn around the entity and the entity details display in a box below the Search box. Click the Show link next to the entity. The selected entity moves to the center of the diagram. Optionally, click the View Lineage link in the entity details box to view the lineage of the selected entity. A template lineage diagram contains template entities, such as jobs and queries, that can be instantiated, and the input and output entities to which they are related. Perform a search and click a link of type Operation. Click a link in the Instances box. 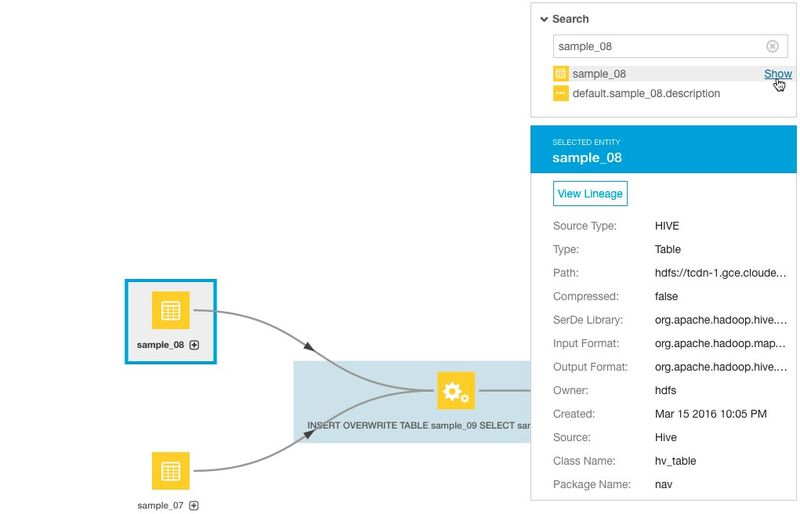 Display an instance lineage diagram. Click the value of the Template property to go to the instance's template.